ELIZABETH ACEVEDO is the youngest child and only daughter of Dominican immigrants. She holds a BA in Performing Arts from the George Washington University and an MFA in Creative Writing from the University of Maryland. With over fourteen years of performance poetry experience, Acevedo is a National Poetry Slam Champion, Cave Canem Fellow, CantoMundo Fellow, and participant of the Callaloo Writer's Workshop. 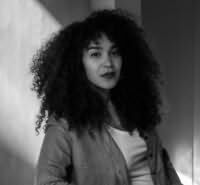 She has two collections of poetry, Beastgirl & Other Origin Myths (YesYes Books, 2016) and winner of the 2016 Berkshire Prize, Medusa Reads La Negra’s Palm (Tupelo Press, forthcoming). The Poet X is her debut novel. She lives with her partner in Washington, DC.